2.4mm O.D and, 7mm O.D. In many applications, small spaces require small solutions. We have developed very small or tiny fiber collimators with long working distance. They are available from 405nm to 1550nm. 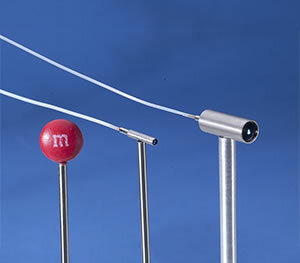 The more popular wavelengths of 450nm, 520nm and 640nm are usually available from stock. Body is constructed of stainless steel. A one meter length of fiber is terminated with FC or FC/APC connectors. Other custom small fiber collimators can be manufactured. Functions such as focusing, beam bending, diverging, polarization control or othe functionss can be made. Please call or email for other wavelengths. High temperature versions also available. Polarizers, focusing optics and beam bending optics are options available for these collimators.